Different types of bicycles use different sizes of wheels. In general, modern bikes use 26-inch or 700c wheels, tires and tubes, of which 700c is larger. 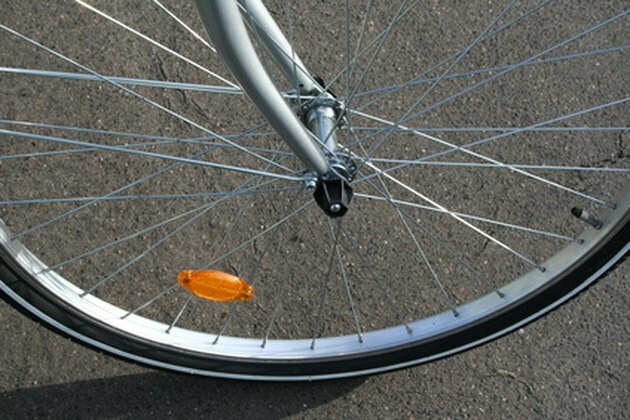 A bike wheel can accommodate a limited range of tire and tube widths, but getting the right tube diameter is essential for avoiding flat tires and ruined tubes. The most common bike tires and tubes are 26-inch or 700c. 700c wheels measure approximately 29 inches in diameter with the tire installed. Other frequently seen sizes are 20-inch, 24-inch, 27-inch and 28-inch. The stated diameter measurement may not match the actual diameter of the tire. For example, Sheldon Brown explains that the original 26-inch tires measured about 26 inches in diameter, but they were also 2.125 inches wide and correspondingly deeper than today’s 1.5 or 1.75 tires. The 26-inch tire designation is based on the size of wheel used to fit those older tires and not necessarily the actual tire diameter. Look for the right tube size based on the tire and wheel’s given measurements, not your own measurements, except when neither the tire nor the wheel indicates its size. Widths of bike tires and tubes vary considerably. On 700c tires, widths are measured in millimeters and commonly measure 18 mm to 35 mm. On other types of tires, widths are measured in inches and range from 1 to 3 inches. In general, tube size is slightly flexible; for example, you may use a 26 x 1.25 tube on a 26 x 1.5-inch tire. However, do not use a tube of a different diameter than the tire and wheel except in an emergency. BikePro advises you can use tubes with widths within ¾ inch of the tire width for 26-inch wheels (used on mountain bikes and some hybrid or comfort bikes), and within 3/8 inch for road wheels like the 700c and 27-inch sizes. The easiest way to determine tube size is by looking on the tube for a printed measurement. To determine the size of tube you need, look for measurements on the tire, either on a sticker or printed directly onto the outer side wall. If you have no tire, measure the circumference of the wheel in millimeters, placing your measuring tape on the bead seat. The bead seat is where the edge, or bead, of your tire rests when placed inside the rim. Refer to Sheldon Brown’s Measuring Bicycle Rim Sizes charts to determine your wheel size and corresponding tube size. What Is the Difference Between a 26 Inch Wheel & a 28 Inch Wheel on a Bike?